LONDON--(BUSINESS WIRE)--A well-known customer intelligence company, Infiniti Research, has announced the completion of their latest article on the benefits of business intelligence and analytics. The article offers a comprehensive view of the challenges faced by companies in the transport and logistics industry and gives expert suggestions on how business intelligence solutions can prove beneficial for companies. The growing competitive market pressure is making it difficult for companies in the transport and logistics industry to sustain their profitability. They are struggling to deliver a consistent brand experience and balance price competitiveness. Challenges such as increasing compliance complexities, volatile fuel costs, and constantly-evolving consumer demands have created the need among companies to look out for solutions that can help them excel in the competitive market landscape. 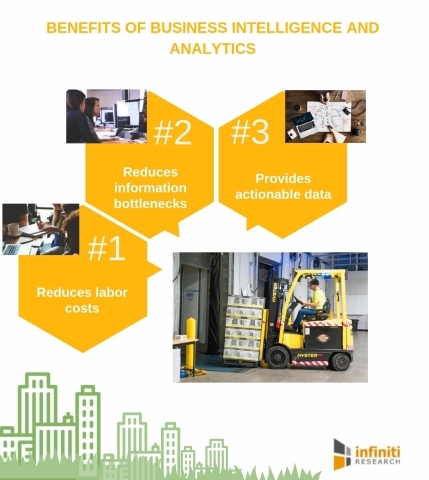 Moreover, growing material and labor costs coupled with market volatility is compelling companies in the transport and logistics industry to leverage business intelligence solutions for developing effective growth strategies. Want to gain a holistic view of the target market and factors driving demands? Get in touch with our experts and know how business intelligence solutions can be utilized for the benefit of your organization. The automated data collection process enables businesses to reduce human efforts by decreasing time spent on extracting data in spreadsheets. It also decreases the training time as reports can be automatically generated on a daily, weekly or monthly basis without the use of excel or word. Business intelligence tools also provide an easy option for businesses to design reports in very less time. Business intelligence solutions give users the opportunity to build individualized operation specific dashboards that are relevant to their operational area. It provides KPI and other vital information that are required to customize dashboards according to the specific needs. Business intelligence solutions can even help businesses to generate autonomous reports and analyze data without IT assistance. This reduces information blockages and improves the efficiency for businesses. Building specific dashboards is still a task for many companies. To know how our business intelligence solutions can help you with operation specific dashboards, request a free proposal today! Many companies hire a considerable number of people to work on various formats of reports. Such reports involve a huge amount of resources and end up delivering long after they were most needed. This not only demotivates human resources but creates the need for making data useful and purposeful. Business intelligence solutions help companies with actionable data models that allow the prevention of conflicting definitions and incomparable report data. They even provide real-time information to present the state of businesses rather than delivering a historical view. Business intelligence tools possess the efficiency to make data actionable by enabling users to spot issues and drill down to detail data in a top-down manner. Want to gain a competitive edge in the market? Request more information and know how our portfolio of business intelligence solutions can help you with relevant solutions. Infiniti Research has announced the completion of their latest article on the benefits of business intelligence and analytics.